1. 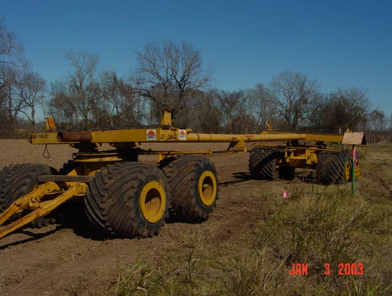 Cross cables for crab steering to enable the trailer to get around on a tight right of way. 2. Locking pin in each turntable to convert to standard type pull trailer if necessary. 3. Tongue on each end of the trailer for maximum utilization. 4. Handle single or double joint pipe – shown for singles with 28’ between the saddles. 5. Quick adjustable saddle width with slide control and chain lock for varying pipe diameter. 6. Two 4” strap winches on each end to keep load from shifting. 8. Capable of handling right of way speeds up to 20 mph. 9. Excellent performance in mud, dirt, sand, snow and more. Used Athey Trailer for sale. Deck surface is 7′ by 17′. Steel track trailer is in good condition. 1. Bi-directional rolligon trailer with locking bolster on each end. 2. 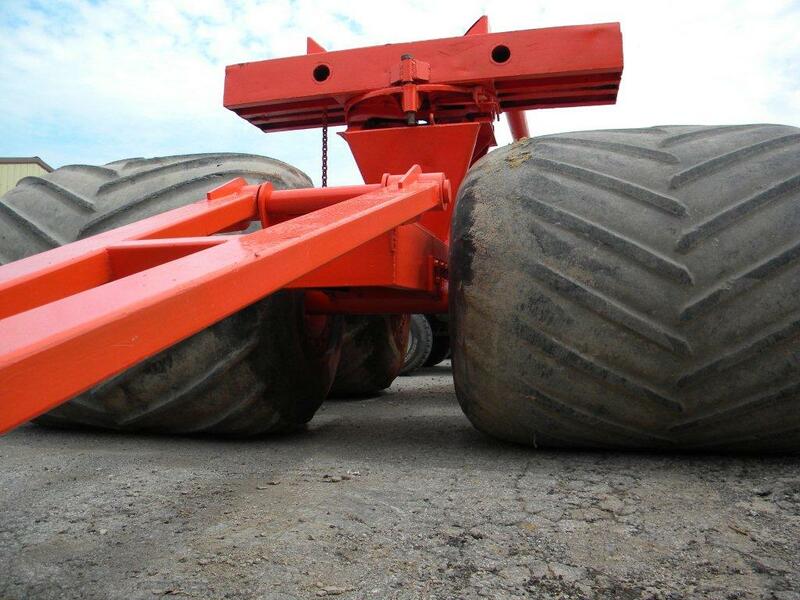 Maximum flotation with giant 54x68x28 tires. 4. Quick adjustable saddle width with slide control and chain lock for varying pipe diameter. 5. Two 4” strap winches on each end to keep load from shifting. 6. For off road use only. 7. The best performance available for tires in mud, dirt, sand, snow and the rest. 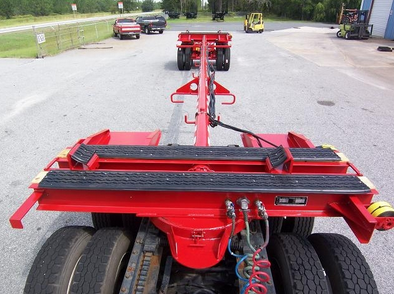 The Challenger Services trailer utilizes the Rubber Track design providing more flotation and stability. The rubber tracks are mounted with a bogie suspension. Brakes and/or hydraulic motors are available as an extra cost option .The trailer has a 90,000 lbs. net pay-load capacity. 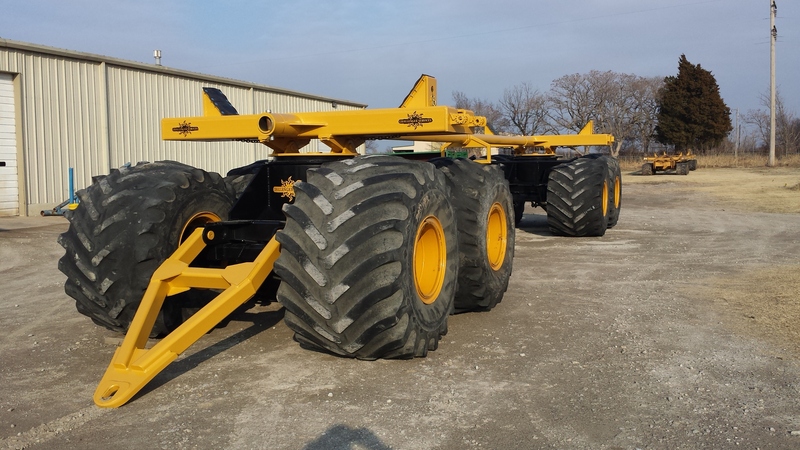 This configuration can be used for pipe or general cargo. 2. Locking pin in each turntable to convert to standard type pull trailer. 4. Handle single or double joint pipe – 65’ between the saddles extended and 32’ between saddles when collapsed. 7. Two strips of durable rubber bolted to each sets of bolsters. 8. Approximately 8 psi ground pressure fully loaded with 90,000 lbs. 9. Capable of handling road speeds up to 30 mph. 10. Excellent performance in mud, dirt, sand, snow and more. 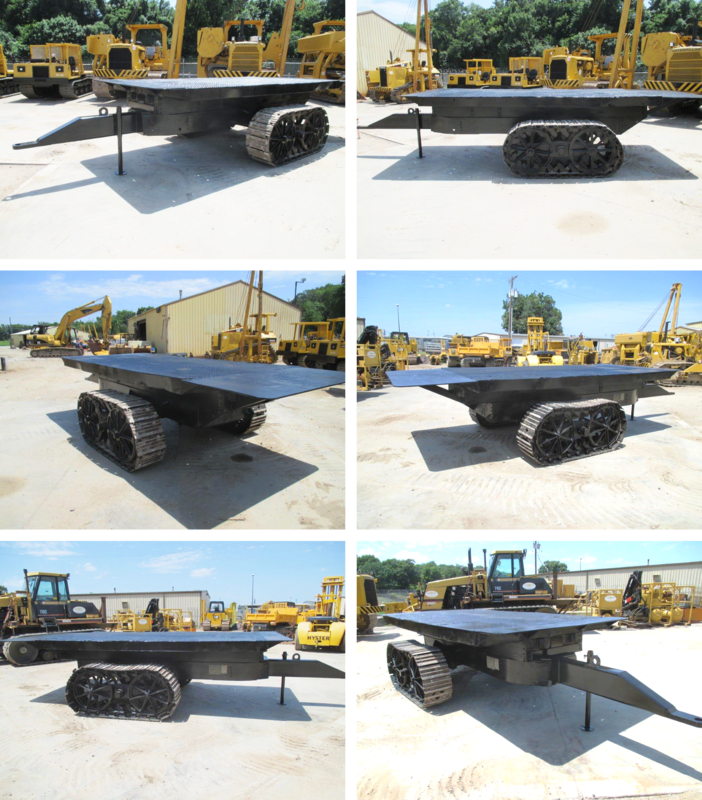 These Challenger Services trailers utilize the Steel Track design providing more flotation and resistance to rock and stump damage than rubber tires. 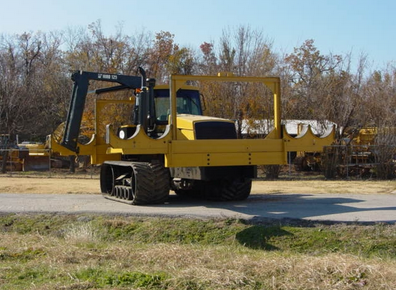 · Handle pipe up to 60 feet long. · The bolsters are spaced 33 feet apart. · Quick adjustable saddle width with side control and chain lock for varying pipe diameter. 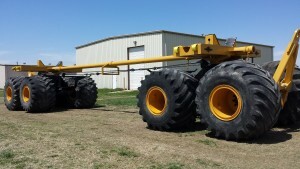 · Two 4” strap winches on each end to keep load from shifting. · Approximately 12 psi ground pressure fully loaded. CPT-20/40,000 lbs. and CPT 30/60,000 lbs. · Maximum towing speed – 6 mph. · Excellent performance in mud, dirt, sand, snow and more. 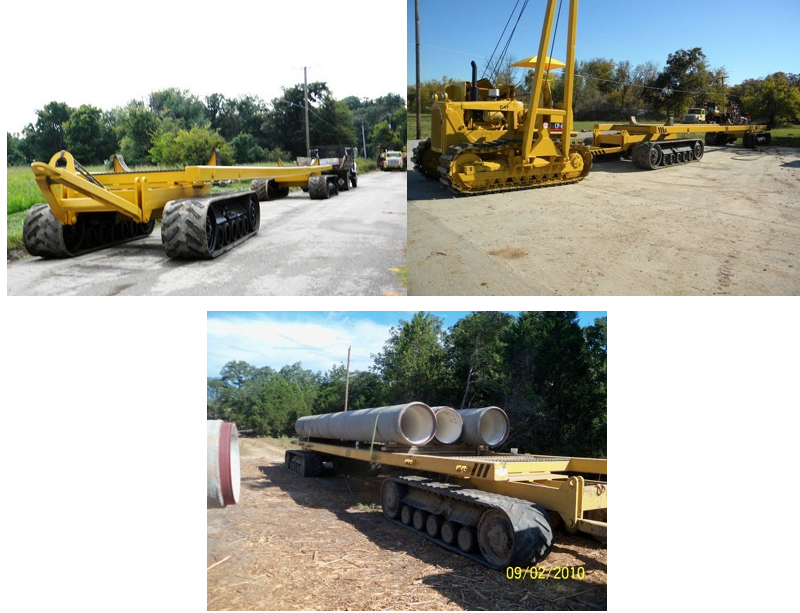 The Challenger Services pipe trailer utilizes the Rubber Track design providing more flotation and stability. 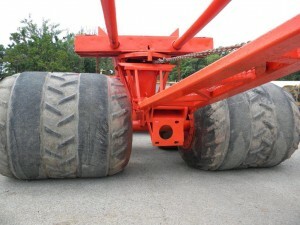 The rubber tracks are mounted with a bogie suspension. 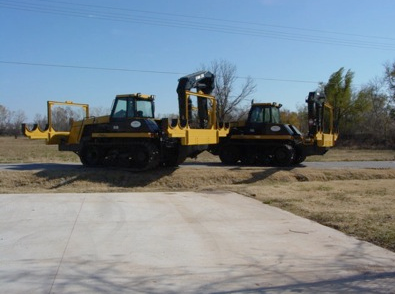 Brakes and/or hydraulic motors are available as an extra cost option . The trailer and dolly combined have a 90,000 lbs. net pay-load capacity. This configuration can be used for pipe or general cargo. 1. Trailer and dolly combination can be used together or just the dolly. 2. 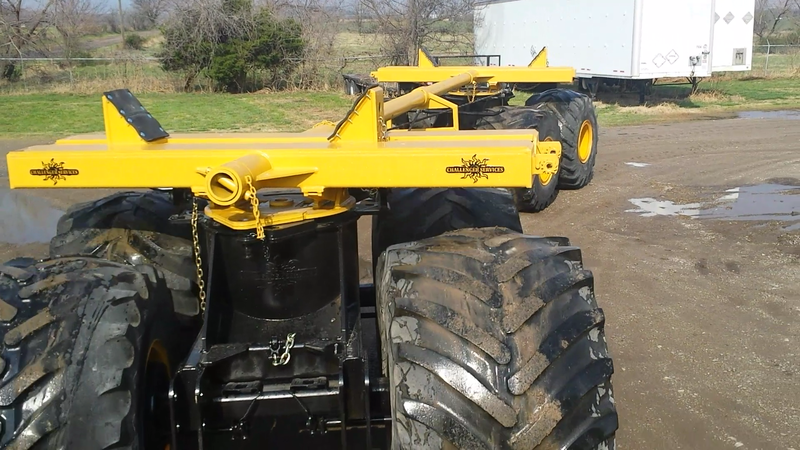 Standard kingpin on dolly to move other trailers around the job. 3. 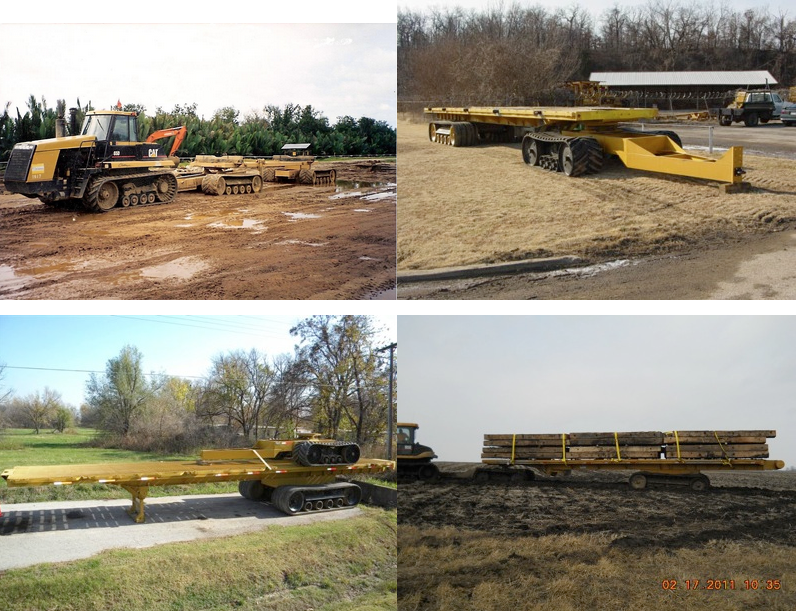 Handle single or double joint pipe – 52’ flat bed with plenty of space for pipe, poles or equipment. 4. Plenty of 4” strap winches along the length of the trailer to keep load from shifting. 5. Approximately 8 psi ground pressure fully loaded with 80,000 lbs. 6. Heavy duty push / pull bumper on the back end of the trailer. 7. Capable of handling road speeds up to 30 mph. 8. Excellent performance in mud, dirt, sand, snow and more. 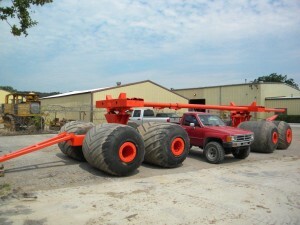 Challenger offer a s a extendable, steerable – on-highway – pipe trailer.